One of the largest members of the deer family. 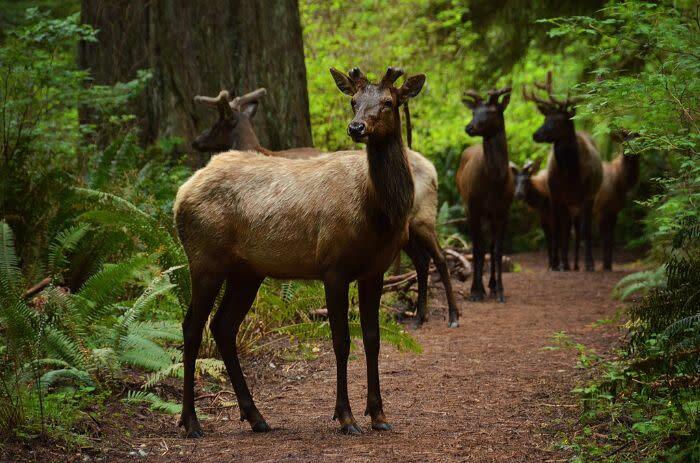 Roosevelt elk are a major conservation success story. Hunted nearly to extinction by North Coast settlers, there were only a few hundred animals left when conservation efforts began. Now the elk number in the thousands and they are being reintroduced to many areas of their original range. Map of where to find Roosevelt Elk. Elk Prairie, on the Newton Drury Scenic Parkway, is the central park location with a visitor center, camping and many trail heads. Elk are frequently to be seen on the prairie, and there are many excellent viewing stations along the Parkway and within the campsite. 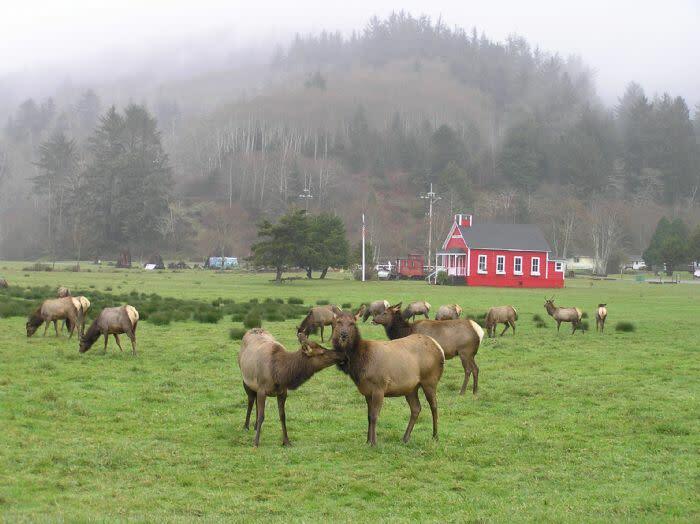 Elk Meadow, just off Highway 101 on Davison Road, has good parking and visibility for elk viewing. A short way further down Davison Road are restrooms, picnic facilities and the Trillium Falls trail. Gold Bluffs Beach: Continue on Davison Rd for another 6 miles and you will arrive at Gold Bluffs Beach. 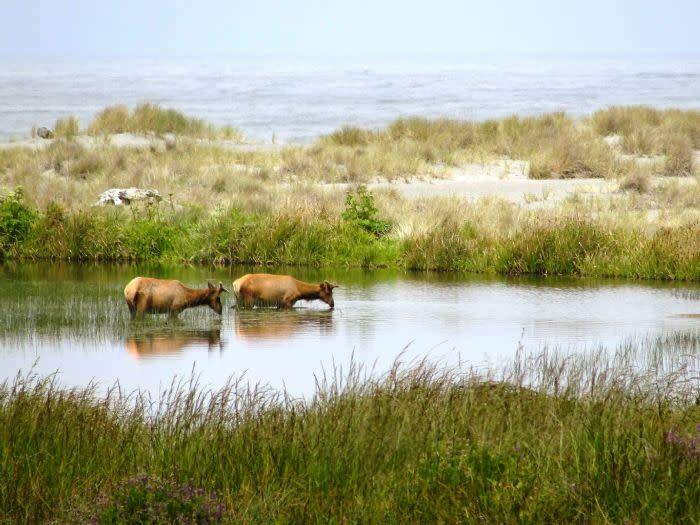 Here you can frequently find elk grazing right along the beach, just off to the side of the road. This is great viewing and can be in close proximity to the elk so please use caution and do not approach or disturb them. Roosevelt elk behavior is much the same as other elk subspecies. They are more active in the cooler hours of the day, early morning and late evening, these are the best times to view elk. Watch the roadsides and open/grassy hillsides for feeding animals. Be careful: elk are wild and unpredictable animals. They are particularly dangerous during calving and the fall rut. Always observe them at a safe distance. Elk are the second largest members of the deer family. Moose are larger. Adult males (bulls) weigh 740 - 1,100 lbs. ; females (cows) 380--640 lbs. Both sexes have a dark head, neck and legs, with a light brown body and a cream-colored rump. Mature males boast large multi-branched antlers, while the shorter antlers of young males (called spikes) usually are unbranched. Females do not have antlers. 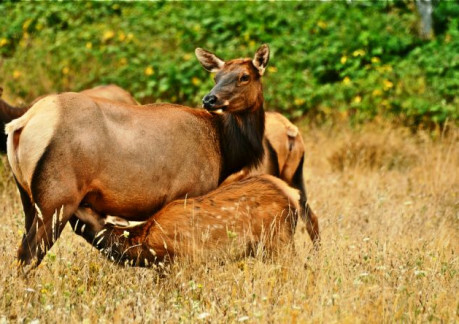 Seasonal changes mark the behavior of elk herds. Autumn: The breeding or rutting period occupies elk from late August to mid-October. 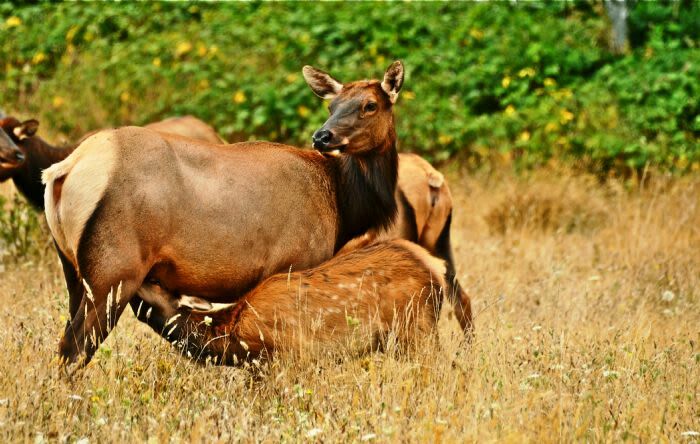 Winter: Due to the mild climate of the Northern California coast, elk in this area do not need ot migrate. Spring: In February and March, males shed their antlers. About a week later they begin to grow new ones at the rate of 10 to 12 inches per month. Calves are born May and June and remain hidden from predators for the first week or two. Later the cows and calves join the herd of females and young males, which is led by an older cow. Older males form separate bachelor herds or remain solitary through the summer. Summer: By late August the bull elk's antlers stop growing and soon the rutting season begins.